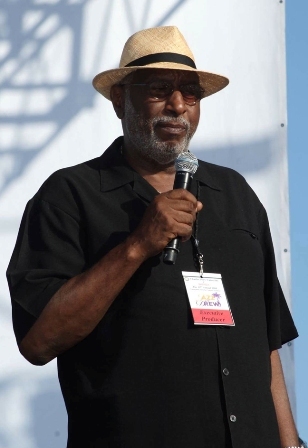 Roland Hayes Betts, founder of Jazz At Drew and resident of Carson, California passed away on Sunday March 19 at Torrance Memorial Hospital in Torrance, California. Born September 11, 1941 in Alton, Illinois to Floyd and Etta Betts as the second child of four, Roland spent his formative years growing up in the city of Chicago, where his father was an original member of the Fruit of Islam and served as a bodyguard for the Honorable Elijah Muhammad. Together with his mother, a loving homemaker and nurturer, Roland’s parents instilled in their children the importance of being involved in their community and to help make changes where needed. After serving with distinction in the United States Marine Corp, Roland made history by integrating the Quantico Marine Base Basketball team as the first African American and non-commissioned officer to join the squad, later earning a full athletic scholarship for basketball during the mid-60s to Pepperdine University. A standout player, he was given the title “Mr. Everything” and still holds the school’s season and career rebound average records. Upon graduation, Roland was offered a contract to play basketball professionally for the Washington Bullets. However, decided to return to Chicago instead to become an active participant in the Civil Rights Movement under Reverend Hosea Williams as one of his “Unbought & Unbossed” field generals, assisting in the successful launch of the Chicago Open Housing Movement. In 1971, Roland relocated to Los Angeles, and joined the staff of the University of Southern California (USC) before accepting a position as the Community Liaison Officer with the then Charles R. Drew Postgraduate Medical School. It was while working for Drew that Roland would meet and married his beloved Cassandra. Together they settled down in the city of Carson, California where together they raised their two sons and daughter. It was also during this time that Roland’s commitment to the community and Drew University led him to create a lasting imprint on both the school and Southern California, by founding Jazz At Drew, a unique collaboration of music and medicine. Roland would often tell the story of how during the late 80’s and early 90’s, he read a medical journal that described how music had healing properties, and that some doctors would even play music while in the operating room. Through this, an idea was born. Serving in a dual role as Director of Alumni Affairs and Community Relations Officer for Drew, Roland collaborated with Aman Kufahamu and Gilda Hagood to launch Jazz At Drew in 1991. The event grew from an audience of approximately 150 people the first year to accommodate some 10,000 jazz fans annually. With the theme “Building Cultural Bridges Through Music”, Jazz At Drew has honored the legends of jazz, raised critically needed funding to support Drew University and created a happening that the entire Southern California community could be proud of. Though many would call Roland a mentor, those close to him would hear him call them “Leader”. When asked why he would use this term, Roland would smile and say it came from his days as part of the Civil Rights Movement saying “We were all leaders and so are you.” Nicknamed “The Riverdog”, Roland was an avid fisherman, proudly boasting a license plate that read “Fish Tremble At The Sound Of My Name”. Loving husband, father, athlete, activist, mentor and friend, Roland is survived by: his wife Ayo, daughter Ayana Betts, sons Jabari Betts and Baraka Betts, 12 grandchildren and a number of nieces and nephews. A viewing will be held at the Inglewood Mortuary located at 3801 W. Manchester Blvd. in Inglewood on Friday, April 7 from 4 to 8 p.m. Memorial service and repass will be on the campus of Charles R. Drew University of Medicine and Science, located at 1731 E. 120th Street in Los Angeles on Saturday, April 8 from 11 a.m. to 3 p.m.